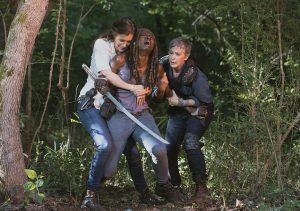 Warning: this review contains multiple spoilers for The Walking Dead Season 9, Episode 5. 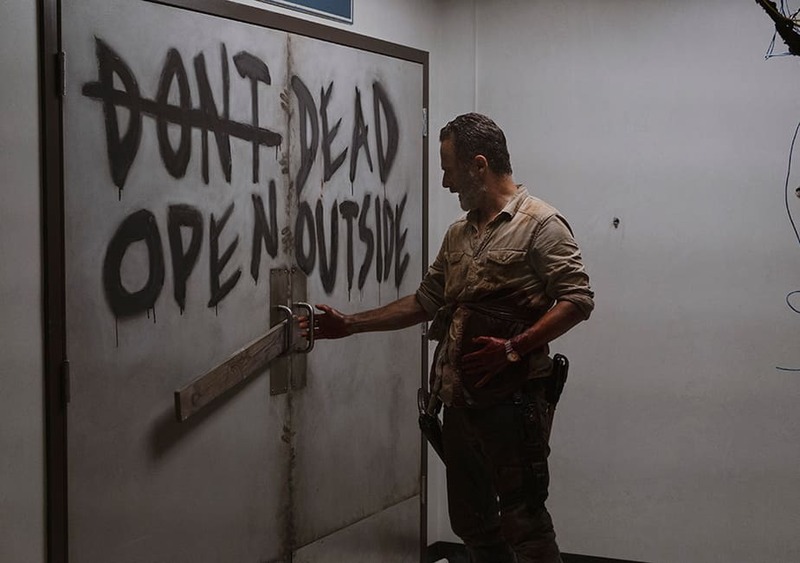 Rick Grimes is gone. Not from the world of Walking Dead, but from the main series. In a way, his exit was what I had hoped to see. He went out a hero, doing what he had to do to save his people, realizing that they are all his family, even if they’re not blood related. Then Jadis saved Rick by giving him to the helicopter people. Yet even that wasn’t as mercenary as it could have been. They wanted an A, and apparently Rick is a B. Jadis had to beg to get them to take the pair; she wanted to help him. So Rick is off with the helicopter people, and has an opportunity to come back to the series in the future. I’m fine with all of that. I liked all of it. It’s what I wanted. The part that bothers me is what happened on Talking Dead after the episode was over. Scott M. Gimple announced that this was not the end of Rick’s story. Rick will be coming back in a ‘series of original films’, produced by AMC. Hearing that felt like a punch in the gut. 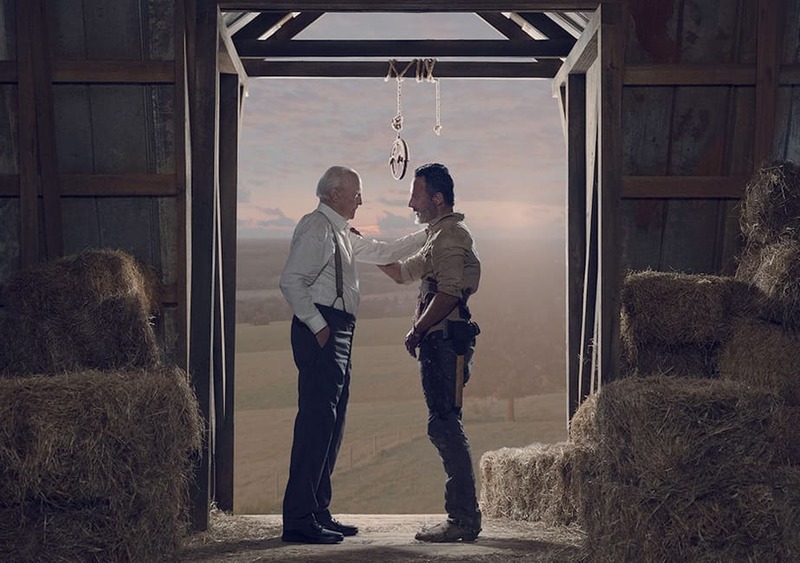 We’ve been told over and over again that these were Rick’s final episodes. 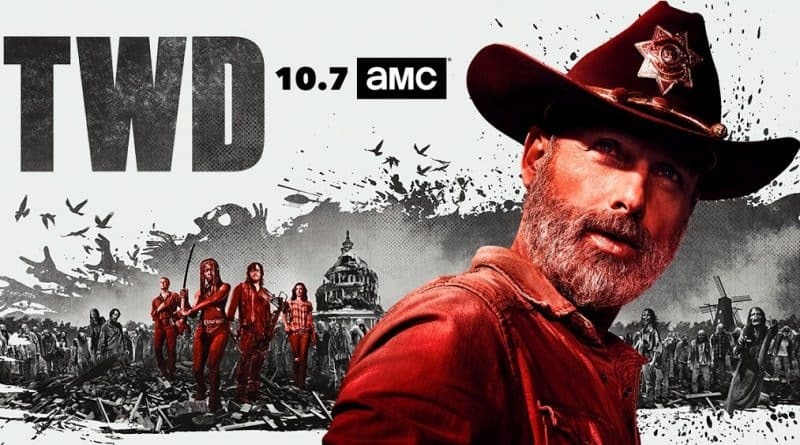 Andrew Lincoln appeared at San Diego and New York Comic Cons, telling the fans that he needed a break from The Walking Dead, and that he wanted to spend time with his family. All of that made sense, and the fans loved him for it, and forgave his desire to exit the series. Now we learn that he’s not really exiting the franchise. Whatever time Andrew Lincoln is spending with his family is minimal, because he’s going to be back working in these ‘original films’. It just leaves a bad taste in my mouth, because I feel duped. I’m sure I wasn’t the only one, but I trusted the showrunners and I trusted Andrew Lincoln. Misleading is one thing (I expected that the ‘final episodes’ terminology was misleading, and that Rick might leave in such a way as to possibly come back later) but outright lying just doesn’t sit well with me. If I didn’t love The Walking Dead so much, it might be enough to cause me to stop watching the series. 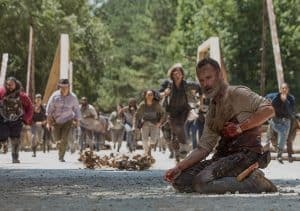 No one wants to see their favorite program jump the shark, and watching Talking Dead last night, that’s what it felt like I was seeing. I’ll forgive them, of course. I’m excited for the new content, especially if Rick does end up in The Commonwealth. I’d love to see more background on them and how they started, more so than they have shown in the comics. 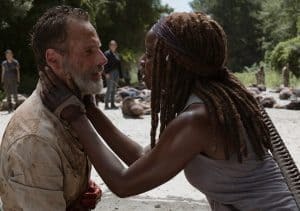 And if the helicopter people are the Commonwealth, then Rick could take the place of Michonne’s daughter in the comics (since Michonne doesn’t have a daughter in the television series) and that story could come through in a believable fashion in future Walking Dead episodes. Even more, the unexpected time jump at the end of the episode (The second this season so far!) allows for some interesting possibilities, particularly with the upcoming Whisperers storyline. 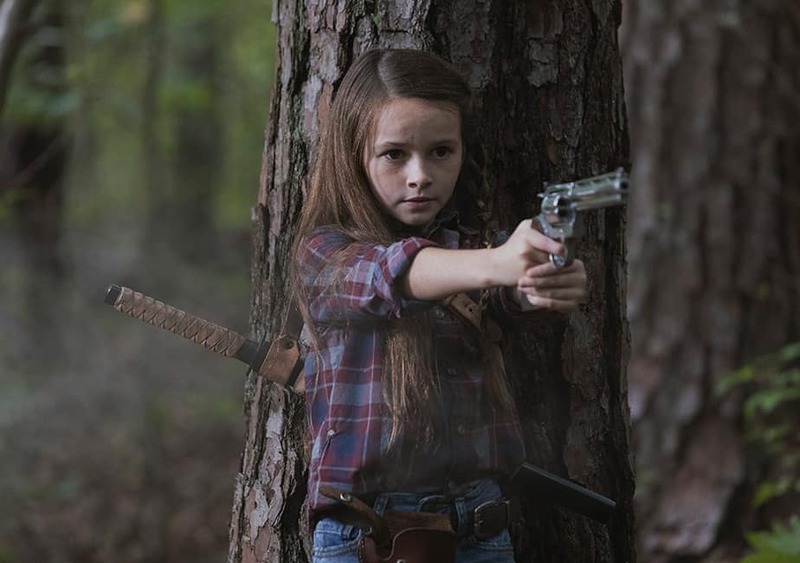 With Judith being older, perhaps she could take the place that Carl had in the comics version of that storyline (although not the romantic aspects, obviously) and we could still see a similar version play out. 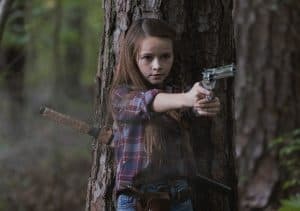 Certainly, from the ‘preview’ shown after the episode, it looks like she might be taking on comics-Carl’s friendship with Negan, which is something I would be excited to see. The introduction of Magna and her companions puts the series back on the general comics plotline, and back toward Robert Kirkman’s original story. 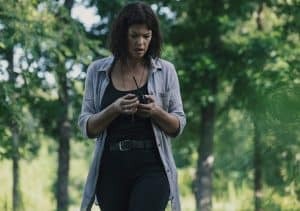 And speaking of Robert Kirkman’s story, I was excited to see Maggie’s confrontation with Negan. Although this happened much earlier in the television series than in the comics, their interactions, and Maggie’s subsequent realization that it is far more punishment for Negan to let him live, is a mirror of what happened in the original storyline. Negan is a social creature, and to be essentially on his own, without any regular interaction with other people, is the worst punishment he can receive. It’s not surprising that he wants to die, given what awaits him in this life. This being said, I like watching the ‘old’ Negan, so I’m hoping that this second time jump brings back more of the personality that I expect to see from this iconic character, and whom Jeffrey Dean Morgan is so good at portraying. Another fun aspect of this episode for longtime fans was seeing the characters of Shane, Herschel and Sasha come back. For me, Shane was the most fun, partly because it’s been the longest since we have seen him, and partly because of the ribbing he gave to Rick. I cracked up when Shane asked Rick, “How’s my girl?” and then pointed out that Rick’s family was actually Shane’s family too. 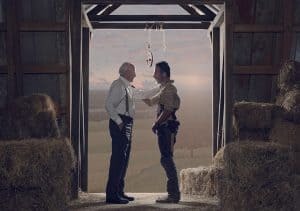 Of course, it was emotional to see Herschel again, especially knowing that actor Scott Wilson passed away after filming that sequence. It definitely created an emotional undertone that would not have been as strong otherwise. 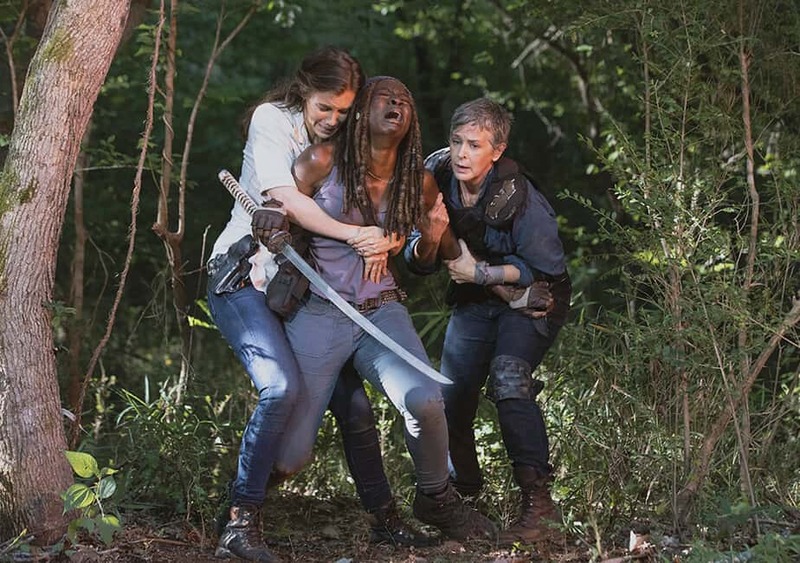 For me, Sasha’s appearance was the least interesting, and when she spoke of their group being their family, and of sacrificing to protect your family, it almost sounded like Michael Burnham (Sonequa Martin-Green’s character on Star Trek: Discovery) talking. Yet I appreciated the sentiment behind bringing in these old characters. 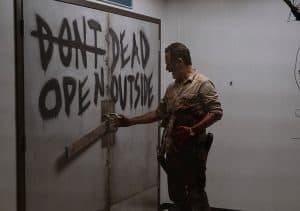 The flashbacks to the first episode were fun, and I had to laugh at ‘Don’t Open Dead Outside’ on the hospital cafeteria door. One moment that made me laugh was at the very beginning of the episode, when Rick used his belt to pull himself off of the rebar. 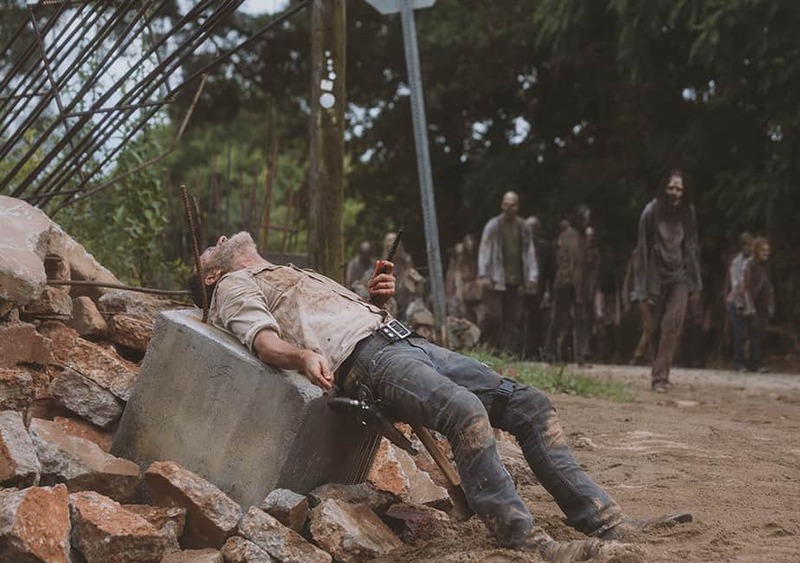 It was a clever tactic, but it was fortunate that Rick was wearing 2 belts that day, else his holster (with pistol and hatchet) might have fallen off! Survival tip in the zombie apocalypse: always wear 2 belts. And this episode review would not be complete if I did not mention Rick’s horse. That horse was so calm around walkers that it must have been hypnotized or on drugs. It was literally standing peacefully at that abandoned cabin when Rick came busting out the front door, surrounded by walkers. Not only did the walkers leave the horse alone, but they didn’t care that it was covered in Rick’s blood. Maybe that horse was the spiritual representation of the horse that carried Rick into Atlanta in the first episode? 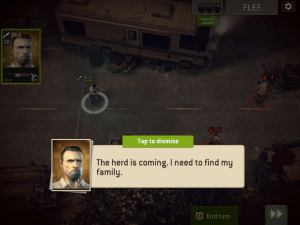 For those who play the AMC Walking Dead mobile games, this episode’s No Man’s Land seasonal mission shows Rick hallucinating on the bridge, looking for his family. 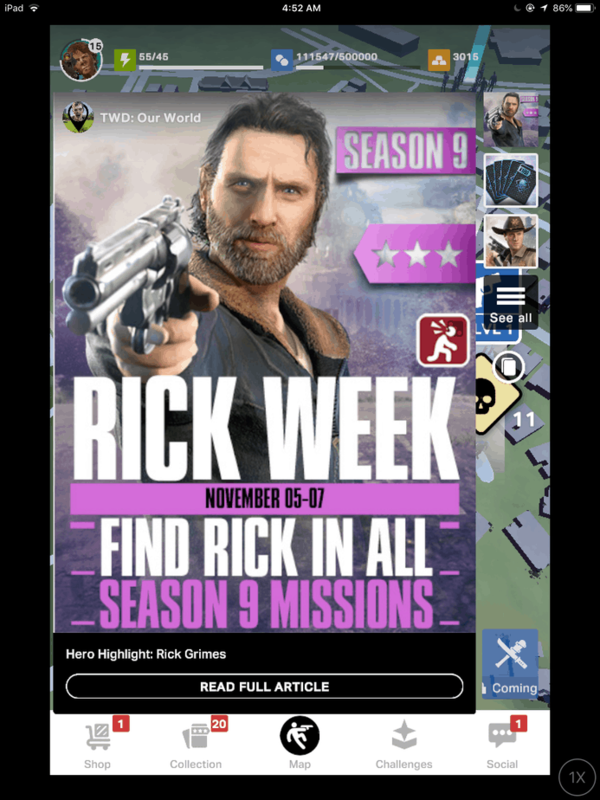 Our World is also highlighting Rick this week, with special infestations, each giving Rick cards. 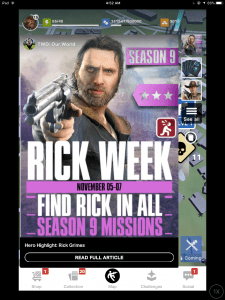 Additionally, Rick has a new upgrade ability and has increased attack speed all week. Do you watch The Walking Dead? Join the conversation on the FoCC forums!